Rich and creamy with just the right amount of spice. 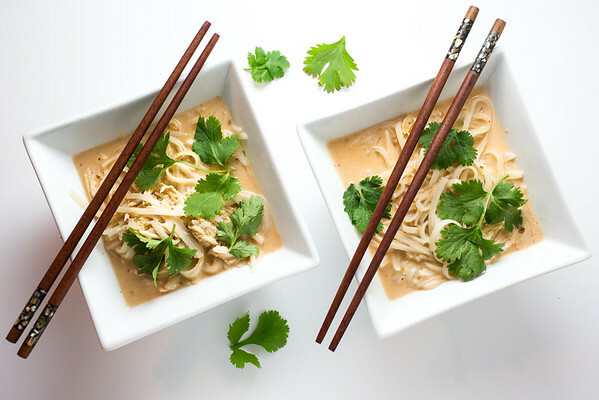 This Slow Cooker Thai Chicken Curry is made all in the crockpot, even the noodles! Fresh ginger, curry paste, chicken, rice noodles and garnished with cilantro. It’s an easy weeknight dinner you’ll make time and time again! If I had to choose one of my favorite Thai dishes, it would have to something curried. I love Thai curries. If you have some Thai curry paste in the fridge, you are almost halfway there! 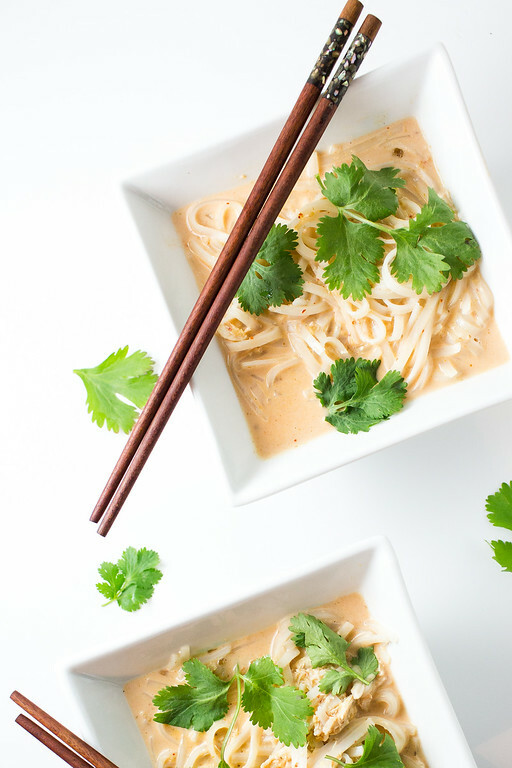 My favorite Thai curry pastes are Mae Ploy Thai Red Curry Paste and Mae Ploy Thai Green Curry Paste – I have both of these in my fridge at all times. A tablespoon or two of one of these added to some coconut milk and you have the most amazing flavorful broth. Thai curries are pretty easy as they are, but making them in the slow cooker makes it even easier. I found this recipe in Thai Slow Cooker Cookbook: Classic Thai Favorites Made Simple . This is a wonderful book, with really simple recipes that you can easily build upon. This recipe was really just the curried sauce and noodles, but it gave the option of adding chicken. You could also easily add bok choy or snow peas, or any appropriate vegetable. In the summer, this would be a great way to use up some surplus zucchini! I added two boneless skinless chicken breasts, I wanted to use thighs, but I didn’t have any in the freezer. Did you know that you could cook noodles in the slow cooker? Well, you can’t cook them all day, but you can put them in about 30 minutes before you’re ready to eat! No more dirtying another pot! Tips for making this Slow Cooker Curried Noodles. Add the coconut milk about 30 minutes before serving so that it doesn’t curdle. Add the rice noodles 30 minutes before serving, they will cook in the broth and become extra flavorful. You can decrease the curry paste to a tablespoon if you don’t want all the heat. If you don’t have fresh basil, you can just use fresh cilantro. You can use boneless or bone chicken thighs or breasts. We love this easy chicken curry at our house. We make it all year long, changing out the vegetables depending on the season. If you make this Slow Cooker Curried Noodles, be sure and let me know what you thought of it and I’d love it if you left a rating! These Slow Cooker Curried Noodles are so easy and are a warm and spicy comfort food! Place ginger, garlic, curry paste, and 1 cup of the stock in a small food processor and process until smooth. Add to slow cooker with remaining stock and chicken. 30 minutes before serving, remove the chicken and add the noodles and coconut milk. Shred the chicken and add back to the soup. Divide the chicken and noodles between four bowls and ladle the soup over the top. Garnish with basil and cilantro. Add the coconut milk about 30 minutes before serving so that it doesn't curdle. You can decrease the curry paste to a tablespoon if you don't want all the heat. If you don't have fresh basil, you can just use fresh cilantro. So, do the noodles cook in the slow cooker for 30 minutes while I shred the chicken? Does the slow cooker have to be on high for that? I left mine on low and it worked perfectly. I added the chicken back after the noodles had cooked for 30 minutes. Your Slow Cooker Curried Noodles look like they would be delicious. Hope you are having a great day and thanks so much for sharing with Full Plate Thursday. I love Thai flavors, these noodles sound fantastic and I love that everything is made in the slow cooker! Thanks for sharing at What’d You Do This Weekend?! I have had exactly the same thoughts about noodles in the slow cooker, Pam, and I’m so encouraged to read that it works so well. This is a lovely recipe – really warming and perfect for this time of year. I’m using the slow cooker a lot at the moment and I can’t wait to try this one. Sharing. I have been putting the slow cooker into over time the past couple weeks, and it looks like I need to continue doing so. What a flavorful recipe! I love using chicken thighs for recipes like this! Thanks, pinned! I love the curry flavors here! Perfect for winter! I just want to slurp the whole bowl up! Great recipe! I’m going to try this with tofu instead of chicken. It looks delcious!!! Can’t wait! What if you don’t like the taste of coconut? What’s a good substitute? Just add more chicken broth, or a little half and half if you want it to be creamy. Love the slow cooker especially on a work day week night when you come home to a prepared meal. I like it on weekends too, so you can have a fun day and still have dinner waiting for you!